Blaise Brosnan is a wise man. In this readable, clear and incisive book Jack, he shares his wisdom with us. We are better for the experience – if we choose to be. – Brendan Howlin, T.D., Minister for Public Expenditure and Reform. Fantastic book…. A marvellous read. – Alan Corcoran, “Morning Mix”, South East Radio. Blaise Brosnan is our Jack. He continues to influence us as our mentor, critic and advisor. I admire Blaise Brosnan’s motivation, dedication and work ethic and above all else his persistence as a player. ‘Playing’ involved persistence, understanding the value drivers, constant innovation, commitment, pragmatism and work. – Owen Killian, CEO, ARYZTA. Success in business begins with the individual. Ultimately, slf-belief, emotional resilience, discipline, and unrelenting personal commitment drive business performance. Blaise Brosnans’s Jack is full of insights and nuggets of wisdom. … plenty of food for thought. I am no longer the limiting factor. Thank you. – Tom Banville, Acting CEO, Wexford County Enterprise Board. Blaise, Best of Luck with Jack. A great success and a testimony of what people really think of you. I’m looking forward to getting to know Jack. I’d like to order ten copies to give as presents to our clients. It will bring inspiration to many and it will be very useful in helping our thought process. Enjoying it. You would definitely feel more proactive after it. – Agnes Relihan, Limerick County Enterprise Board. The stuff of which success is inevitable. It’s very good. It is more authentic than any of the other stuff. I really enjoyed your first book and dip into it from time to time. The first book I’ve read from cover to cover. I found it to be a fascinating and educational read that cause me to think and reflect at every page . Can’t wait to read it a second time. I find a reading a chore. Except your books! I will recommend it wherever and whenever I can. A beautifully written book that captures the essence of life and its influences and relevance to business. 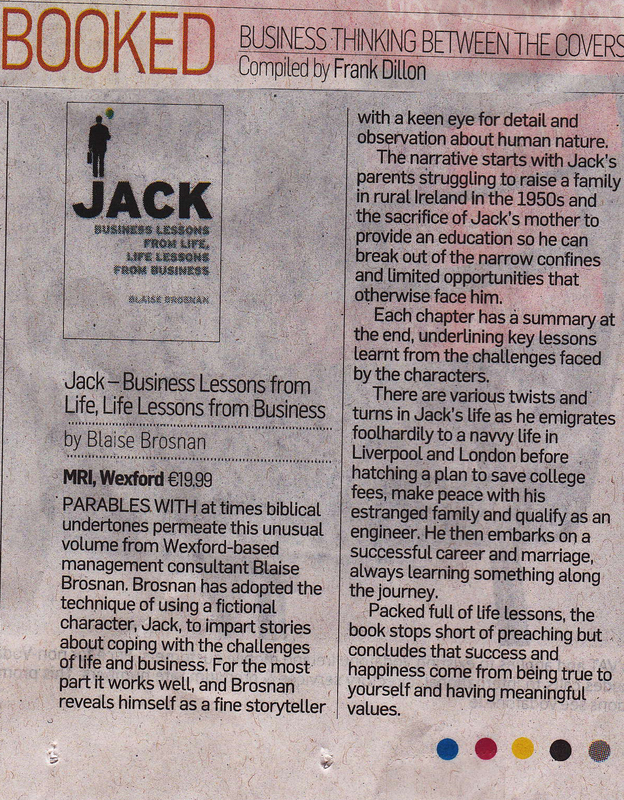 It draws out the key lessons from Jack’s life experiences and how ultimately it shapes his success in balancing life and business. – Breege Cosgrave, Wexford County Enterprise Board. I loved your book Jack. I could not put it down. Jack is fantastic, even though I admit to not having quite reached the last page yet. I think I am intentionally prolonging it. Parents give us three things that are the foundation stones of our lives – a loving environment, educational opportunity to pursue whatever our dreams are, a set of personal values to act as our moral compass. Money is a good barometer of success but not happiness. As Jack progresses through his life, the knowledge gained through the University of Life or the School of Hard Knocks is shown to be of equal importance to Jack’s success as his academic qualifications. I read Jack and truly enjoyed it. Is a must read for any budding entrepreneur or business owner. I really could relate to the different characters in this book as if they were people I’ve known and met along my life so far. As I read each chapter, a switch clicked in my head with how relevant it was to my past and current situation. A great read. The most interesting read for as long as I can remember… this book certainly has put to rest a few ghosts of mine. Thanks. Jack is an easily identifiable figure whose experiences and insights explain the business of life and the life of business in practical, relevant and familiar terms. – Brendan Byrne, Agri-business consultant. Blaise Brosnan has changed my life. He taught me the meaning of the world Focus. Many thanks. My Mom, Maree, just sent me over your book with my youngest brother on Friday. I started reading it and I couldn’t put it down. I just finished it today and wanted to drop you a line to tell you how much I enjoyed it and how applicable it is to every walk in life. – David Lyng, restaurant manager, Annapolis, Washington DC, USA. This book from the off is full of nuggets of wisdom which have been communicated clearly and are inspiring for the reader. It allows the reader to exercise their freedom to utilise their talents with peace of mind and a good conscious. As you are reading you are learning. It challenges and helps you to be a good leader, teacher and manager of both yourself and your business. I believe that it should be part of the school curriculum, as you can build greatness from a young age.It shows incredible humanity.Thank you Blaise for showing me another insight into my life. Jennifer McGreery, Kilkenny. Leslie Codd has read JACK. “Hi Blaise. Hope your keeping well. Read “jack” on holidays this year. Really enjoyed it. I think everyone can relate to jack and the way he was reared in 1950sIreland. I have handed it around to a few people and they also raved about it. I suspect the core character has more than a few similarities to yourself…..? Hope to catch up soon. Best of luck and continued success. Leie. Just a note to thank you for penning “Jack”. Coming from a small farm in Kilcummin, I really connect personally and deeply with Jack’s story which resonates with a keen sense of people and place. I now work in the coaching and training industry and your book, I believe, could serve as an excellent primer for those starting off on a career journey. Will be recommending it at my classes! Blaise, thank you for all the wealth of knowledge I gained through your published books. I wish you a very happy Christmas and continued success with future publications. Thanks for the good advice, which follows on many bits of good advice I have learned from you over the years. I would like to recommend your latest book, Jack, as a great New Year present for anyone with any interest in building a business. It combines sound business strategies combined with what is almost a social history of Ireland in which JACK shows the lessons to be learned from other people’s experiences. By weaving your advice into life as it was lived in Ireland, and still is, you bring it to life. A belated Happy New Year to you! Wishing you health, happiness and prosperity for 2012! Your nuggets of wisdom always serve as a call for action! You’re new book Jack is fantastic – I haven’t finished it yet (I’m not much of a reader in the evenings so I’m still at it!). I hope all is well with you! I’m keeping my eyes open for the next Blaise Brosnan course in the Carlow CEB so see you soon. Blaise, while I was on holiday in the slums of Nairobi in Kenya I took the time to read you book “JACK” (one of the few books that I have ever read) and I have to say it had a profound effect on my thought process in relation sorting out my company affairs. I came home fromAfricawith the view that I didn’t need to be backed into a corner in relation to the critical outstanding matter. By reading Jack I was better able to understand that there were a number of other options opened to me. More importantly I was willing to accept them as an outcome. I worked on my strategic position so that I had all my other options ready to go and at the next meeting with the other sides solicitors, I didn’t fall for their tactics and put on the table my alternative proposal. In addition I had decided my WAP. As a result of this we signed an agreement yesterday with terms that are much more favourable to me.I would like to thank you for the lessons that I learned from your book Jack. Some of these lessons have proved invaluable to me during these delicate negotiations. Blaise has a wealth of knowledge and expertise in business and life coaching. I have heard Blaise speak on a number of occasions and found him to be extremely personable, motivational, interesting and a man who really cares. It’s with Blaise’s help that businesses have gone from strength to strength and are highly successful following his advice. Blaise has a very hands on approach while objectively looking at results. I cannot recommend Blaise or his books highly enough. If you are a business owner or manager, taking part in Blaise’s Management Development Programme will certainly be one of the best gifts you can possibly give to your business! His in-depth knowledge and experience coupled with his relaxed and personable approach to teaching is a winning combination. I enjoyed the programme so much that I have not hesitated in recommending it to many business owners since. Bianca Divito, Divito Studios Art Glass. Thoroughly enjoyed You are the Limiting Factor and even more so Jack (as you suggested I recognized myself and many others I know within its pages). Now that I’m back in the UK on my second tour of duty and managing a manufacturing operation I’m getting a chance to implement many on the strategies set out in You are the Limiting Factor. Many thanks to my wife Jacqueling for buying it at one of your guest speaking presentations and Mags Kirwin of Goatsbridge for recommending you so forcefully at one of her in home networking social evenings. Blaise I would like to wish you every success with this book and I will be looking forward to reading your next. Blaise I wanted to email you to tell you that I have only picked up your book in the last month to read and that I find it amazing – THANK YOU! “I am near finished reading JACK I could not leave it down when I started great stuff . I finished Jack over Christmas and certainly got a good few points from it. Great read! Enjoyed reading Jack over the last few days nearly finished . Frightening the parallels I had with him in some ways, your description of farming mentality and particulary boarding school was on the money ..not as lucky as him on the football field though ! !.Great lessons in it all . Talk to you on monday.